(AP) A 60-year-old woman has been arraigned on second degree murder charges in the death of her estranged husband. Helene Mitchell-Abraham is accused of killing 64-year-old Wendall Abraham September 23rd at his home near Remer. Lawmen say following an argument, the woman spotted Abraham in the rear view mirror when she stepped on the gas of her van striking and killing him. She then roped his body to vehicle and dragged him into the woods. His body was found last weekend. Mitchell-Abraham was arrested in Mankato. (AP) Utility work north of Bemidji ended tragically Thursday. A worker died when a trench collapsed. Crews tried to rescue the man, but he died at the scene. His name has not been released. The crews were digging a trench to repair a water main when the accident occurred. The Crow State Park is one of several state parks that will be holding a special permit deer hunt to manage the population. The DNR advises anyone visiting a park during these hunts to wear blaze orange or other brightly colored clothing. Visitors should also check for hunt-related information at the park office when they arrive and look carefully for signage related to the hunt. Access to the parks will vary around the state during the special hunts. Some parks will remain open to all visitors, some will have limited public access, and some will be open only to hunters with special permits. The deadlines for youth and adults to apply for a special permit to participate in the hunts – which include regular firearms, muzzleloader and archery options – have passed. The permit hunt at the Crow Wing State Park runs December 3-5. Fall is a time of movement and migration for many of Minnesota’s wildlife species. White-tailed deer, which maintain an annual home range of about one square mile, increase their daily movements and become more active during this time of year. The shortening days of fall also trigger a whitetails’ reproductive cycle with the peak of breeding coming during the first two weeks of November. As bucks begin to search for receptive females, they may separate the male fawn of the year from its mother. 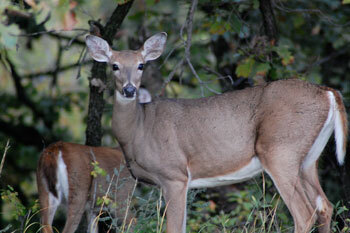 Yearling bucks, participating in their first breeding season, may move many miles from their home range. The DNR encourages motorists to increase be observant because a deer standing calmly in a field may suddenly jump into the road; anticipate the potential for this rapid change. 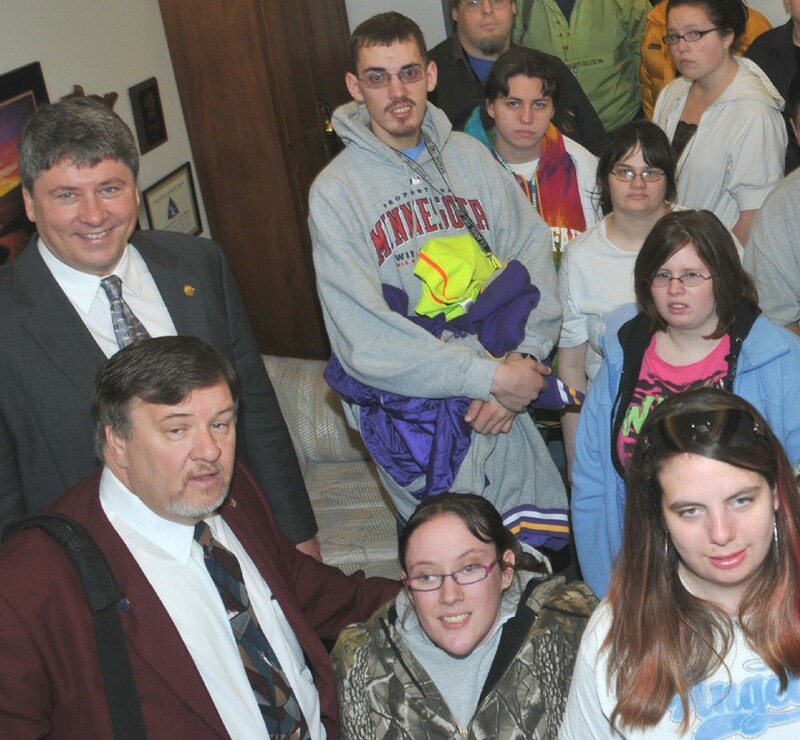 Central Lakes College has been awarded a 5-year, $2,199,895 million grant by the Office of Postsecondary Education, U.S. Department of Education under the federal Transitions Program for Students with Intellectual Disabilities. Central Lakes College is one of 27 institutions of higher education in 23 states receiving this grant. Some examples of entry-level employment that students in the Occupational Skills Program obtain following graduation are food preparation, janitorial, retail, cashier and stock clerks, and entry-level health care positions. Placement data results from OSP show 94 percent total related employment for recent graduates. The Central Minnesota Drug and Gang Task Force along with the Bureau of Criminal Apprehension arrested two men on drug charges in Todd County. 40-year-old David Minh Phan of Farmington and 34-year-old QuyTrong Nguyen of St. Louis Park are accused of growing 443 marijuana plants in Little Elk Township in Todd County. They have been charged on multiple counts of 1st and 2nd degree controlled substance crimes. (AP) There were some anxious moment near Long Prairie Wednesday, as lawmen brought commandeered van under control. A mental health patient from Fergus Falls was to be transported to a secure facility in Anoka when he kicked the driver out of the van and stepped on the gas. A chase ensued involving a Becker County deputy. It ended near Long Prairie when the 37-year-old man tried to make a U-turn. He was struck from behind by the deputy. He is currently in jail. The Brainerd Warriors are ranked 8th in Class 5A football this week, same as last week. Brainerd is undefeated at 6-0. The Pierz Pioneers are ranked number 10 in Class 2A, with a 5-1 record. McGregor is number 6 in 9-man football. The Pequot Lakes Patriots dropped out of the top 10 in their class after losing their homecoming game last week to Crookston 40-15. The Pats had been ranked number two. Don't be so fast to burn those leaves. The Minnesota Pollution Control agency says they can be used to prevent your septic from freezing this winter. Steven Mikkelson, spokesman in the Brainerd office of the MPCA says it only takes a few inches of autumn leaves over the tank and speptic field to prevent a winter headache. Mikkelson says straw works well too. He also recommends pumping the septic tank regularly. What kid wouldn't want to have a real stun grenade in his fort. The kids of Eric Swenson of Sebeka had the grenade, police radio, a pair of night vision goggles and an ammo clip in the fort. So how did Swenson get the armaments? He's the town Police Chief. He reported the gear missing, only to discover his kids were using the stuff to hold off make-believe bad guys in the back yard. No CSI Special Crimes Unit for the buckos for a while. The Republican challenger in the 8th district congressional race has received the backing of the Minnesota Citizens Concerned for Life, even though long time incumbent Jim Oberstar is also a prolife candidate. The MCCL has endorsed Chip Cravaack because Oberstar backed the federal health care overhaul. MCCL Director Scott Fischbach claims Oberstar "Walked away from the pro-life movement." Oberstar opposes abortion rights, but hasn't had the group's endorsement since 2006. Oberstar says he worked with anti-abortion Democrats to make sure no federal funding would go toward abortion, and got President Obama to commit to a policy banning federal funding of elective abortions in an executive order. Oberstar says the MCCL is putting politics over its mission. (AP) The city of Wadena would get state assistance in rebuilding its community center under a proposal to be considered by a special legislative session. The old one was destroyed during the June 17th tornado that ripped through town destroying several buildings including the high school. The assistance is part of a framework to be considered by a special legislative session. The session will be called once the federal government decides how much assistance they will send to Minnesota. The package is aimed at helping local governments rebuild from recent natural disasters. Cutting Local Government Aid would be one way to help balance the state budget, according to Kevin Goedker, Republican candidate for House District 12 A.
Goedker is the current President of the Brainerd City Council. He tells KLKS news, that cities are not as accountable for the LGA dollars, as they are for other taxes and fees they collect. The state revenue shortfall is projected to reach $5.8 billion to start the next biennium. Goeker is challenging incumbent DFL-er John Ward who favors a proportional approach to balancing the budget with equal measures of income tax increases, spending cuts and government streamlining. Ward says he wants to see no cuts to education or nursing home funding. (AP) The Cass County Sheriff is looking for 60-year-old Helene Mitchell-Abraham. She is considered a "Person of Interest" in the "Suspicious" death of her husband. 64-year-old Wendall Abraham was found dead of traumatic chest injuries, at his Remer home Saturday. A van belonging to Mitchell- Abraham was spotted in Mankato Sunday evening, license plate number 689BUL. The Sheriff says she was a part-time resident of Garrison. It's party time for Brainerd Lakes loons, according to DNR Nongame Specialist Pam Perry. Loons are territorial when they are nesting and raising chicks. But starting in mid-summer, groups of non-mated loons, or loons that were unsuccessful with nesting, begin to gather and move around between lakes. Perry calls these groups "loon parties" because they are indeed socializing and not fighting. Sometimes the loons will circle and actively interact. As the summer wanes on, these groups get larger and blend into the pre-migratory behavior of gathering on larger lakes. 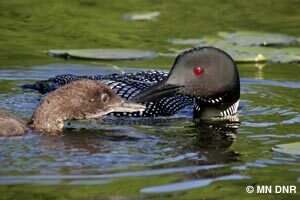 In September, many adult loons that successfully raised chicks leave those lakes, and their chicks, to join the loon groups. In 1998, loon counts completed on Mille Lacs and Winnibigoshish lakes documented a peak of more than 1,500 loons on each lake in mid-October. The loons then fly south to the ocean for the winter, leaving in late October and November. The Driver of a sugar beet truck is dead after colliding with a freight train in northwestern Minnesota. The Hennepin County Medical Examiner's Office says 47-year old Robert Forsman of Breezy Point was pronounced dead on Saturday at Hennepin County Medical Center in Minneapolis. The State Patrol says Forsman was driving a beet truck Thursday when he came to a railroad crossing and did not stop. The truck was struck by one of the two locomatives pulling the 66-car train. The accident happened about 11 miles east of East Grand Forks. A light plane crashed in a hay field a mile south of Clarrisa in Todd County, shortly after 10:00am this morning. The Todd County's Sheriff Office said the single engine plane's pilot was injured, but his injuries did not appear to be life threatening. The name of the pilot will not be released until Wednesday morning, according to authorities. The crash is under investigation. The DFL and Republican candidates for State House District 4B have different solutions for fixing a $5.8 billion revenue shortfall projected for the next biennium. Challenger Meg Bye tells KLKS news, the shortfall won't be fixed easily, and should include both spending cuts and tax increases. She says raising the income tax would be more fair than raising the sales tax, which would be harder on low income people. Bye says education has already been cut so much, that it will have a dreadful impact on the future of schools. Incumbent Larry Howes says the budget can be fixed without raising taxes. He says the assumptions made on future spending during the past session can be changed. Howes says the economy can not sustain the growth in government and spending. Nisswa and Wadena will receive a share of the $4.2 million Parks and Trails Legacy Grant Program. The Minnesota Department of Natural Resources is awarding grants to 17 local communities to help local governments acquire, develop, restore, and maintain parks and trails across Minnesota. Nisswa will receive $890 thousand to acquire two acres of shore on Nisswa Lake for nature-based recreational activities, and provide the first public access to the lake, near downtown and the Paul Bunyan State Trail. Recreational Trail from 8 to 10 feet and to complete major repairs along a 1 mile segment of the trail.